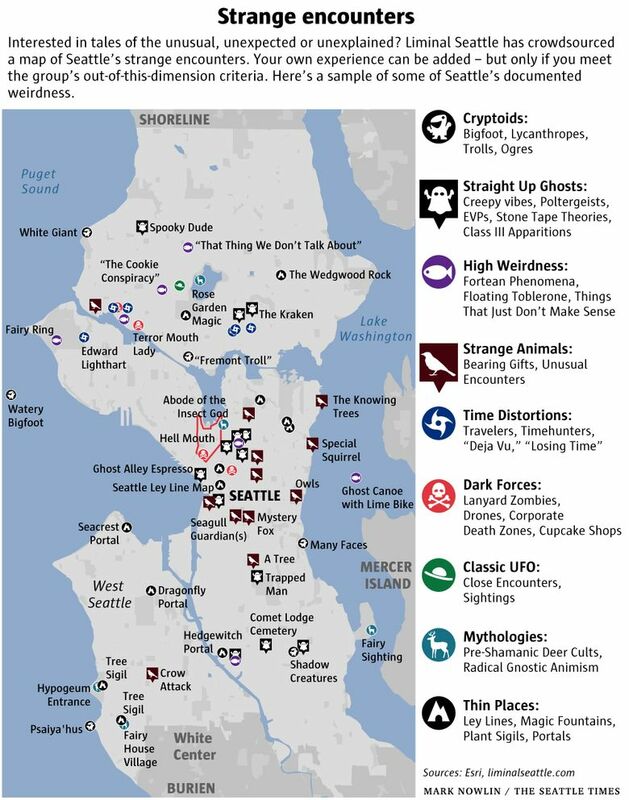 Jeremy Puma and Garrett Kelly, friends and observers of the paranormal, have launched a crowdsourced map of the Seattle places where people have experienced peculiar, preternatural or spooky phenomena. Got an addition for their map? They want it. Seen something strange in Seattle? Felt something you can’t explain, like a mysterious presence on a Georgetown porch, a canoe that seems to be paddling itself, a haunting hum on Vashon Island — or a place where the veil between this world and the next seems thin? 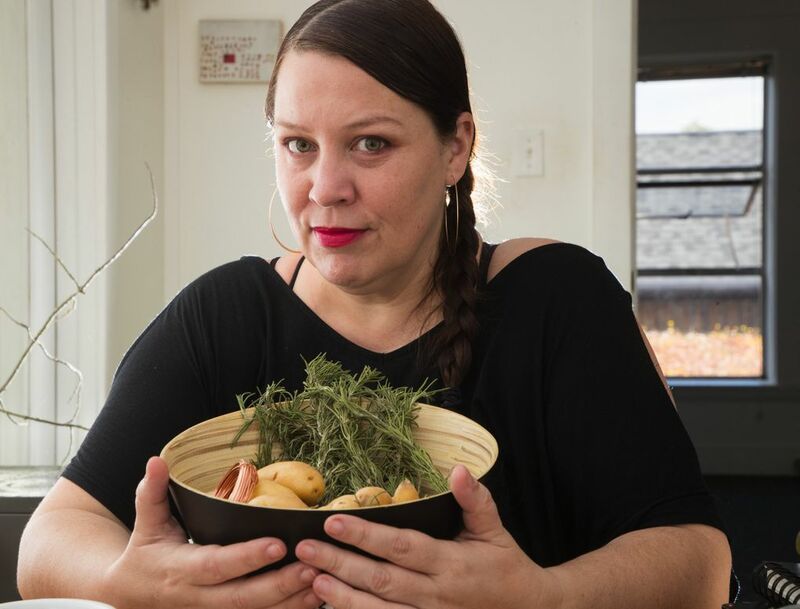 According to people who say they are sensitive to these kinds of things, Seattle and its surrounds are magical places of unusual spiritual resonance. Jeremy Puma, 42, and Garrett Kelly, 37, longtime friends and observers of the paranormal, say they feel it, too, and earlier this month decided to launch a crowdsourced map of the places people have seen or experienced peculiar, preternatural or spooky phenomena. Kelly — founder of Hollow Earth Radio, a low-powered FM station focused on obscure audio — and Puma want people to submit their own personal encounters with the unusual and unexpected to Liminal Seattle for inclusion on the map. The two friends hope to foster the esoteric by mapping it and decoding it with help from the community of contributors and believers. And people are responding in droves. See Liminal Seattle’s full map here. Then there’s the “unconfirmed” report of a “Ghost Canoe,” floating on Lake Washington, with a Lime Bike on deck. 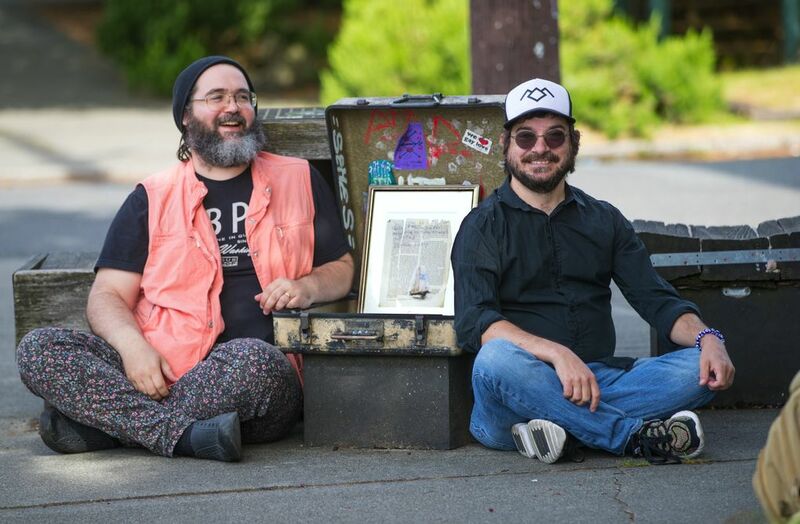 The Liminal Seattle creators added that some of the entries, such as the one labeling Medina the “Colony of the Damned,” are meant to be tongue-in-cheek fun rather than a condemnation of a whole neighborhood. According to the map, there have been sightings of a strange man in Bremerton with one hand cuffed standing by a car, a fairy-house village in Fauntleroy Park, a squirrel that sat “on a huge pile of horse chestnuts going to town on a chocolate donut,” a fountain near Madison and Summit with “some of the heaviest spiritual miasma” outside of South Lake Union and a crow that defecated on a girlfriend who turned out to be a bad actor. 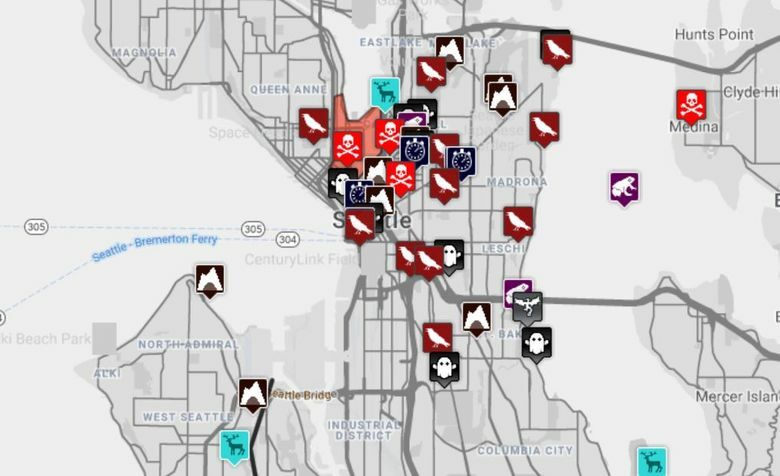 The map also gives the locations of a number of alleged portals, such as the sculpture of a dragonfly in a West Seattle park, which is said to be a gateway to other dimensions on the hottest days of the year, and the Hedgewitch Portals, built at the Equinox Studios in Georgetown. The artistic installation features 100 pounds of moss, lichens, other botanical specimens and string models of Einstein-Rosen bridges, or wormholes. Kelly and Puma, for their part, are thrilled with the reception of their project. They’ve already learned about a plethora of places they now want to explore. If interest keeps building, they plan to publish a printed edition of the map and perhaps organize group tours. Do they really accept all the legends, tales and reports as truth? “It’s not useful for me to be skeptical,” Kelly said.